All right, listen I’m sorry I hollered at you yesterday. Sometimes I get into the whiskey and it makes me a little froggy in my bloggy. Here’s an ice cream cone. Look – we’re going to Zanesville! Yep, seven o’clock in the morning, and we’re on the open road, headed for the Muskingum County Courthouse, home of the dude who set his own personal collection of zoo animals free into the wilderness a few years back, then killed himself, and cops had to chase his zoo animals all over the county. Obviously, that’s not how they word it on the sign coming into Zanesville, but if I run into the guy who orders the signs, I’ll run it up the old flag pole. 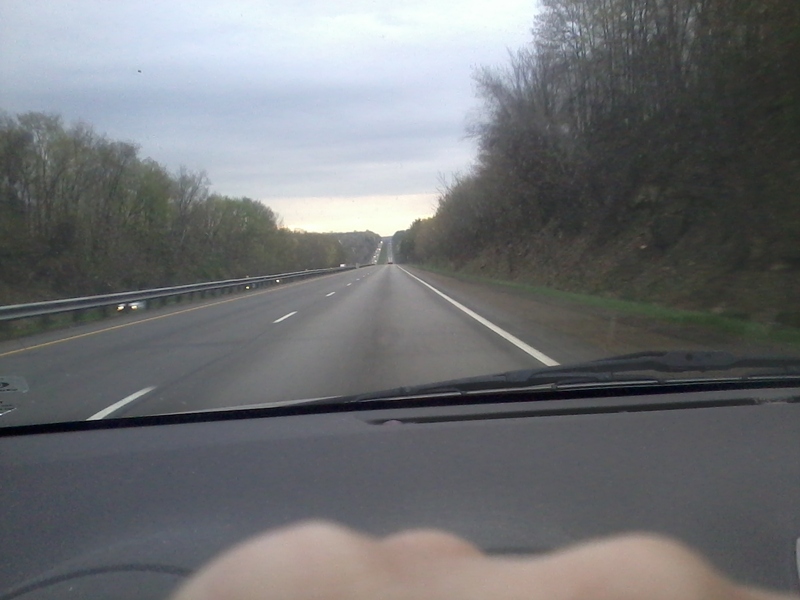 Zanesville is best described as lumpy, like they built the town on a giant, horribly messed-up bed. It’s old, too, and looks sleepy. A lot of lawyers, oddly. 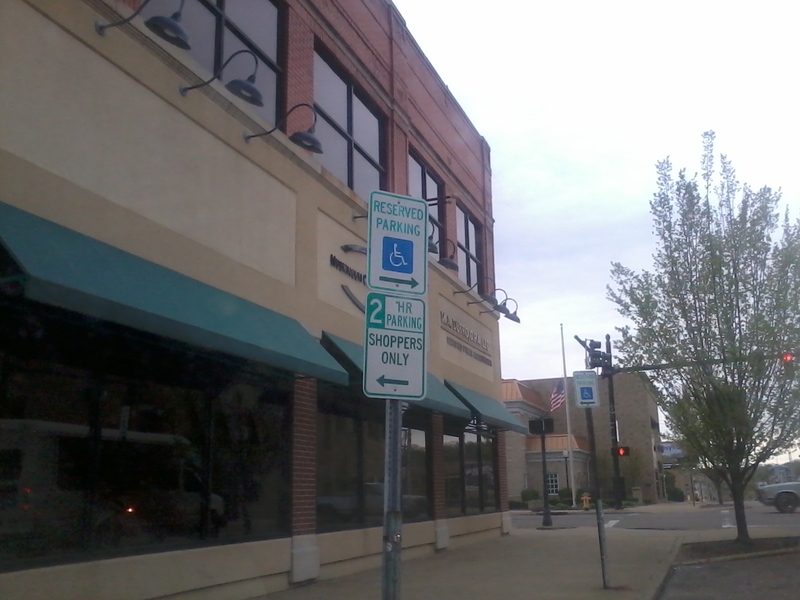 Do you think this sign is at all confusing? I am pretty sure they can’t write me a ticket for failure to shop. This seems pretty unenforceable. So I think the sign is saying, don’t drive into Zanesville and park your car and then just expect to lurk around, doing nothing at all. Because that seems like an obviously cool, fun thing to do, and I’ll bet people are always trying that. Well, fortunately, I’m a guy who likes to lurk. Let’s go on inside and lurk around the Courthouse. The way I see it, if you’re going to hang around someplace, Security should know about you. You got to keep them on their toes. I always try to walk into a Courthouse like I’m there to put the SYSTEM ON TRIAL. Make some noise with my heels – click, click, click. Holy Christmas! Look at this! That’s today! 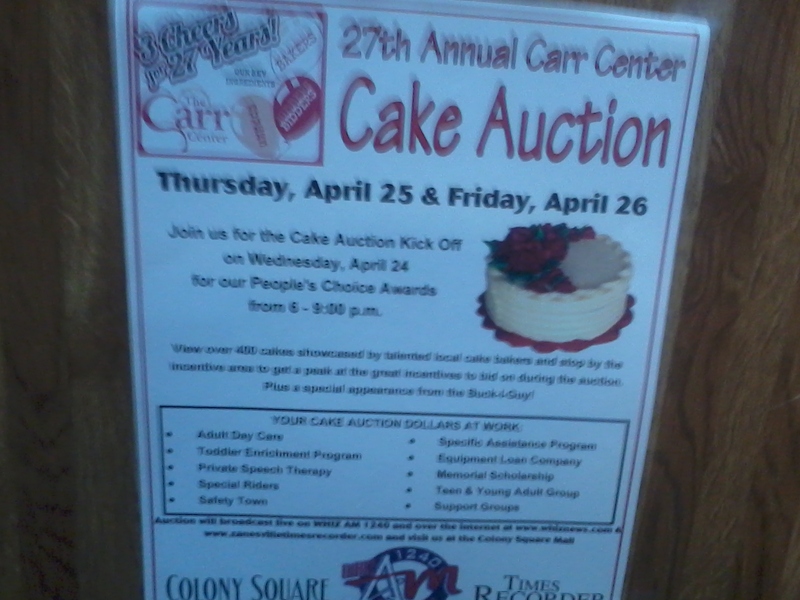 There’s a cake auction today! That thing on the wall of the elevator is talking about real cake. We could go bid on a cake – that’s all I’m saying. Jeez. All right, third floor, this is weird. We come out into a plain hub office that’s full of stacked boxes. 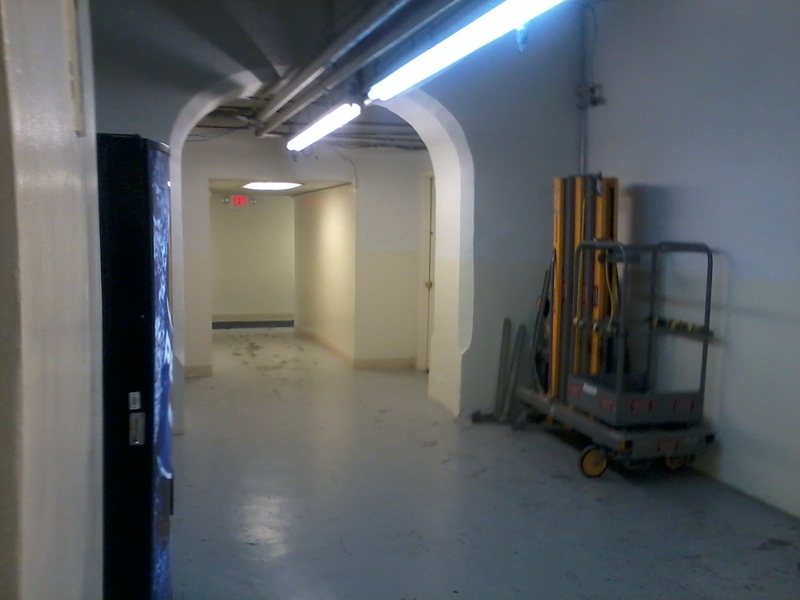 People are working in an area ahead of us, but we’ll follow the arrow for the Engineer’s office and there’s this hallway. 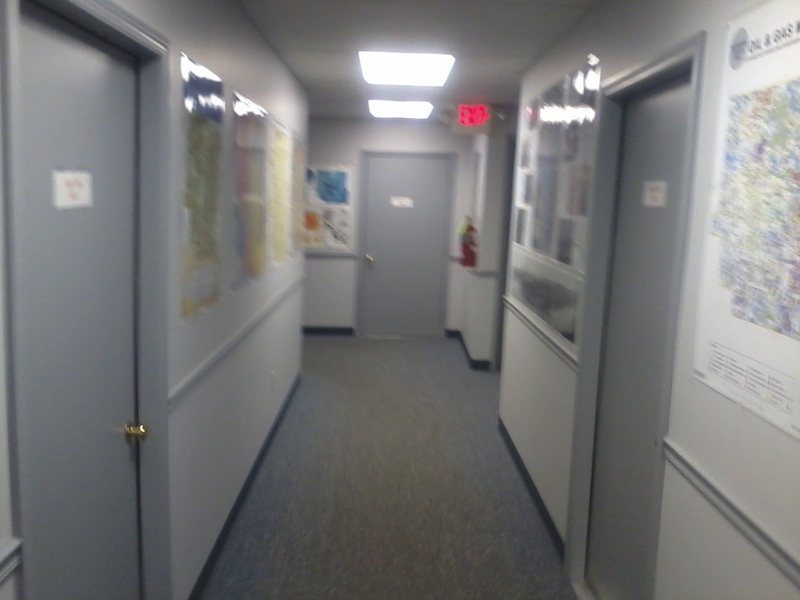 Very quiet, completely empty, and with an Exit Sign clearly marked ahead. A little blurry, I know. I am as you are aware, pretty easily freaked out. Because look – there are little white signs on every other door in the hallway. Guess what they say. Every door. 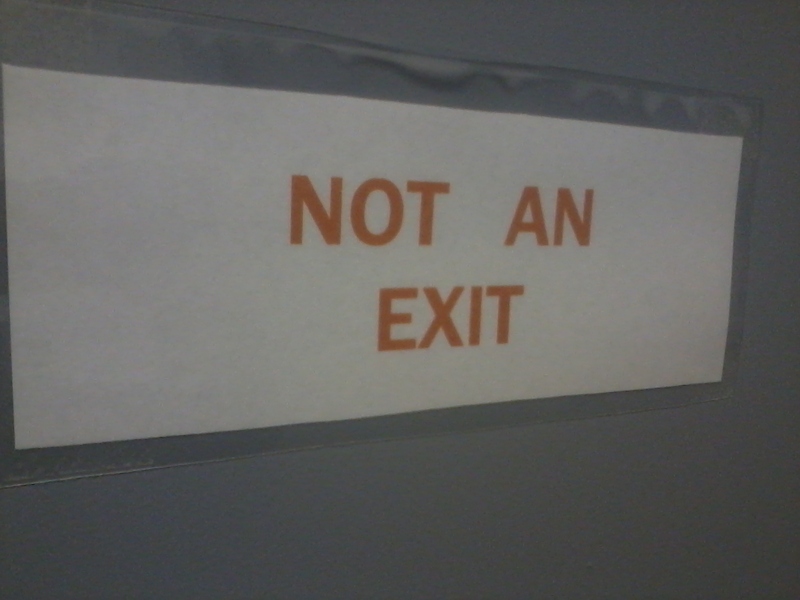 Every door that isn’t an exit has one of these signs, clarifying that it is not, in fact, an exit. So again, when people start putting up signs, there’s been a problem, like folks are always yanking random doors open around here. Hey, is this how I get outside? NO! See? In case you didn’t know what it is. 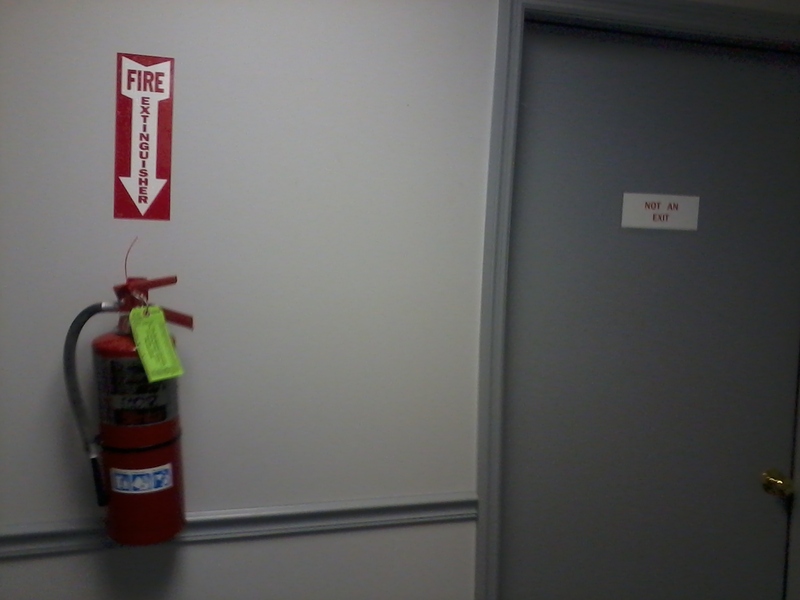 And that door next to it is not an exit, so don’t screw around with it. Fine – we’ll just go down to the map room at the end of the hall, but it turns out. We’re early. We need to kill twenty minutes, and I can’t think of a better way to do it than lurking. People think that lurking is just standing still but no, you can lurk in motion, you just do it slowly and dart your eyes around. Some people coming, voices from the workplace. 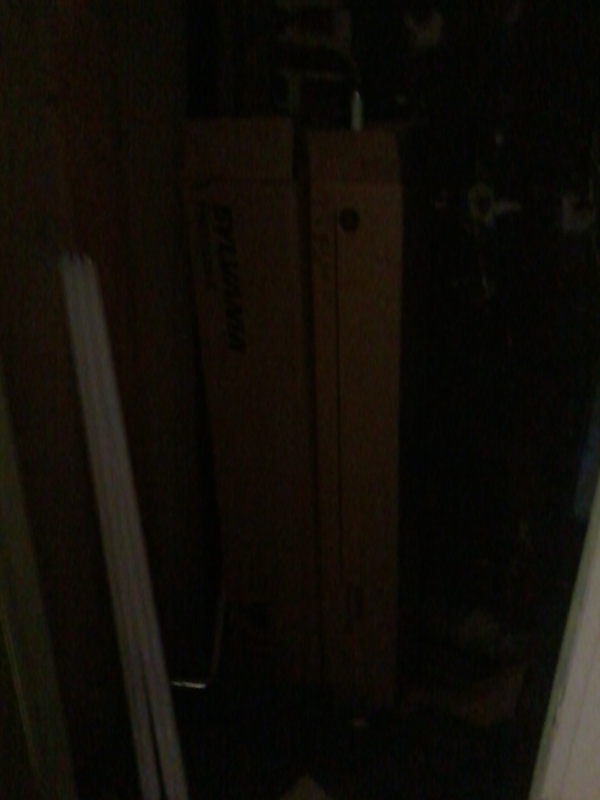 Some kind of utility closet. I swear I’m going to stand here for a few seconds thinking about how entertaining it would be to get in the closet and start shouting, pretending to have gotten trapped in it. They should put up a sign! No, let’s get out of here, people don’t like it when you’re poking around government buildings for no reason. We’ll go lurk out front and maybe there’s a cart where you can get a hot dog with an egg on it or something. Aw dammit. A little blurry, but we can see there’s some stuff down there to look at. Let’s go on down, take a look, try and be calm when we’re snapping pictures from now on. It’s just a blog, Tom, relax. Do your breathing. 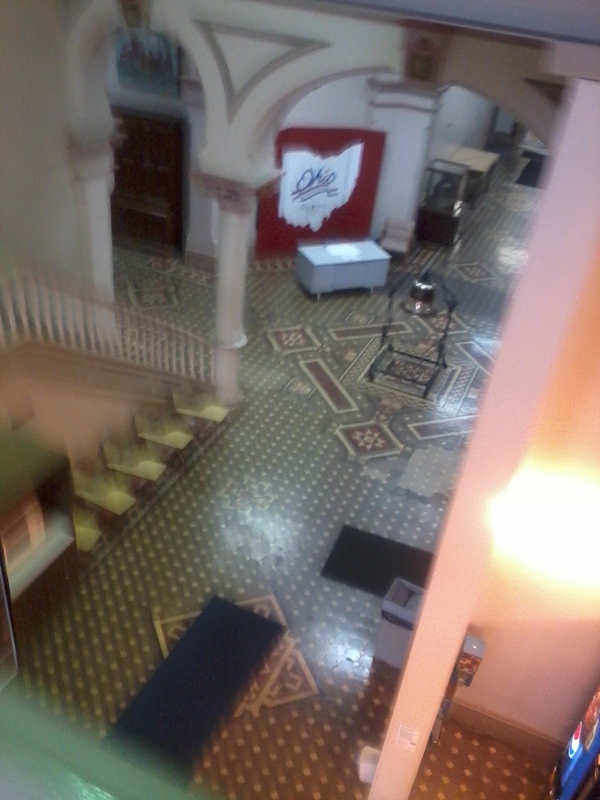 Hmm, here’s a table with some stuff on it in front of the Seal of Ohio, and is it religious stuff? Yes! It is, which is fine with me. It looks like the ACLU has already been by and made them take down their Buddy Jesus statue or whatever, and so instead there’s a table and it happens to have a religious book open on it. 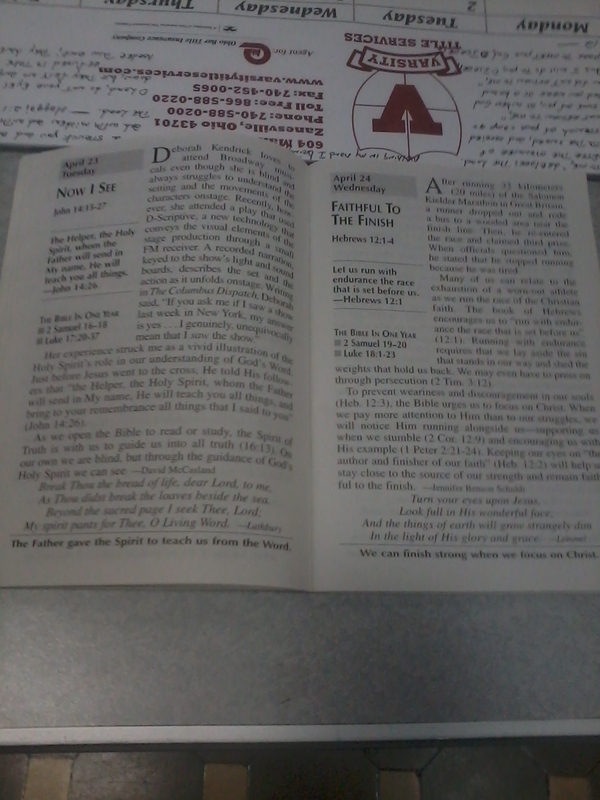 I don’t think that’s a Bible. Oh, I see, it’s The Bible In One Year. Huh. Okay, and the desk calendar also has religious stuff scrawled all over it; I can tell it’s religious because of all the colons. Personally, I don’t care if you want to put religious stuff in courthouses, mostly because I’m lazy and indifferent. But I know the ACLU loves going around picking on small town courthouses in the middle of recessions. Aw well – sometimes you get the bear, sometimes the bear gets you. I guess the idea is, when the ACLU comes by they’re like, hmm, I don’t know who left that there, go ahead and take that away. And then they have a whole box of books and calendars in the back, that’s what they do at parties, scrawl on calendars. Okay, getting creeped out, let’s head over here and check out this bell in this glass case. That piece of paper hanging on it looks like it was typed decades ago, and it explains that the bell was the original town bell, and that it donged when someone died and when there was an emergency and when the Civil War started. The paper explains that the bell was brought here by boat from somewhere and then carted up through town and that it’s a very, very special old bell. 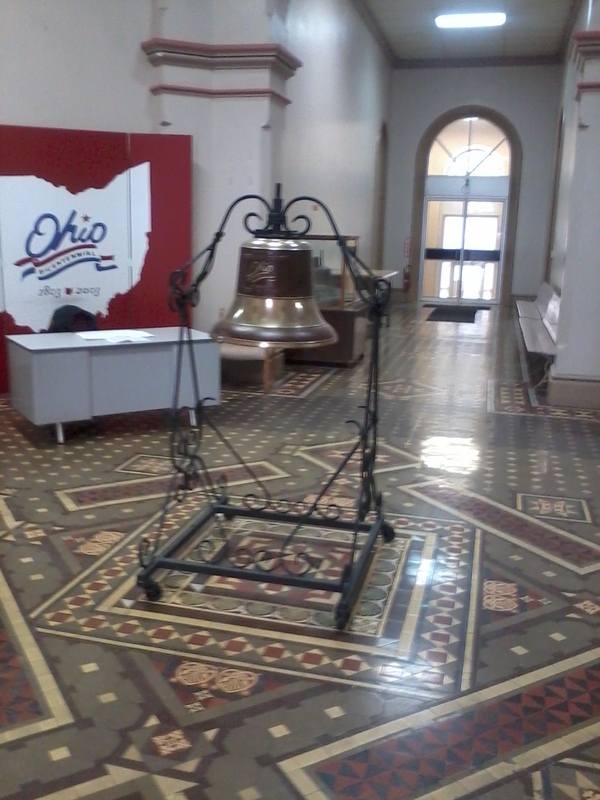 So they keep it in a glass box tucked away behind this shiny, new, prettier bell in a beam of light at the center of the Courthouse. 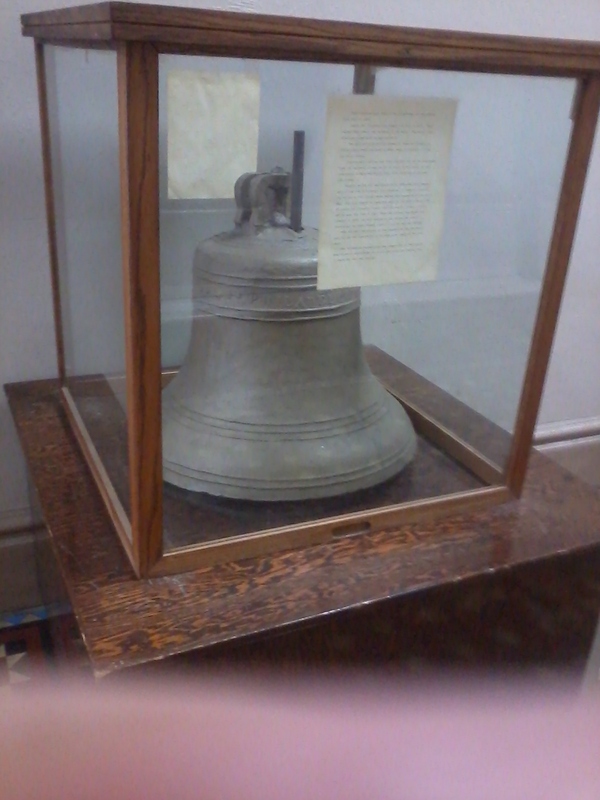 It’s a replica of some other bell. Man, you guys sure love that old bell, don’t you? All right, starting to get the old Eyeball from folks. Let’s get up to the map room, hand a guy a piece of paper that we are not allowed to FedEx, and then seriously, get back in the car and drive back to Columbus. We’ll just blog about that.